Brevard Art News: Fifth Avenue Art Gallery 30th Annual Holiday Craft Show. Fifth Avenue Art Gallery 30th Annual Holiday Craft Show. It’s that time again for the much anticipated Holiday Craft Show at the Fifth Avenue Art Gallery. This year they have added many more handmade one of a kind crafts both functional and decorative from the country’s best artisans. There is blown glass, handmade dolls and books, pottery, unique Christmas ornaments, jewelry and much more. It is a fabulous place to get all your holiday shopping done with unique gifts to please the pickiest person, in all price ranges. The earlier you shop the better the selection. For 30 years, the Fifth Avenue Art Gallery has been known for the best in hand crafted gifts for your friend and family. 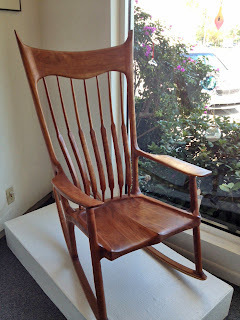 They are highlighting two beautiful wooden chairs handmade by an American Wood Craftsman, Al Gustave.